RIO has announced the expansion of fly lines in their Skagit Trout Max Shooting Heads and Scandi Short VersiTip collections. IDAHO FALLS, IDAHO (January 31, 2018) – RIO Products, manufacturer of industry-leading fly lines, leaders and tippet material, extends the range of fly lines offered for the two-handed trout Spey angler. 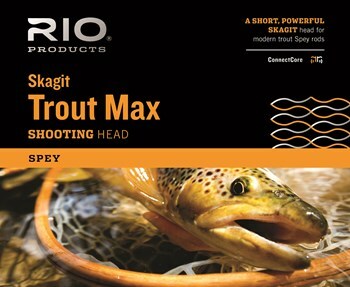 Skagit Trout Max Shooting Heads are perfect for Spey casting with tight obstructions and when using large streamers and sinking tips. The mass distribution allows effortless, sustained-anchor casts to launch sink tips and weighted flies with exceptional ease, while the short length makes them ideal tools for casting in tight quarters. The new sizes in this range are the #1 wt (150 grains), #1/2 wt (175 grains), #4 wt (300 grains) and #4/5 wt (325 grains). Though designed for two-handed trout Spey and switch rods, these heads are an excellent choice for casting big flies on single-handed rods – as long as anglers adjust the line size by 3 (use the #1 on a 4wt, for example). The heads have an MSRP of $49.99 and more information can be found by watching this video. 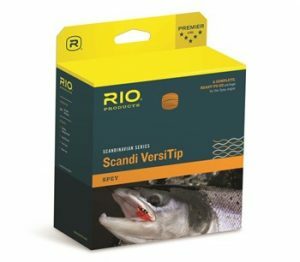 RIO also now offers anglers their popular Scandi Short VersiTip in a new 3wt option (240gr). With four, 10-foot long interchangeable tips (float, intermediate, sink 3 and sink 6), it is the ideal system for trout Spey rods offering complete versatility for changing conditions. Learn more about this series in this video, and find them at your nearest RIO dealer for $149.99.